One of my most favourite things in the world is the opportunity to start-over. Just when we’re thinking that the year is stale, that our new years resolutions are but a glimmer in our eye, and the summer has left us ragged around the edges. Well, here comes a fabulous opportunity to start over. That’s what September feels like to me. The summer just gets a bit crazy and we’re not the person we were before it all began, so now’s the perfect opportunity for new starts. So all of those habits you dropped and lost during the summer, all the trepidation or perhaps excitement at starting the new term or getting back to work brings a new chance to change any daily habits or routines that haven’t been serving you and to start over. One daily habit that helped me massively in my corporate city life as a lawyer was the habit of re-framing my ‘happy hour’. You know the time – when you come in from work and you’re absolutely exhausted from the day and maybe your mind is still frazzled. It’s the perfect time for a brain-numbing drink, so you forget your worries. But one thing I did when I worked in the city to break the habit of reaching for a glass was start a handstand practice! It was the perfect pick-me up, it got me out of my head and into my body, and made me forget about the worries of the day. I can’t recommend a ‘happy hour’ yoga practice enough! 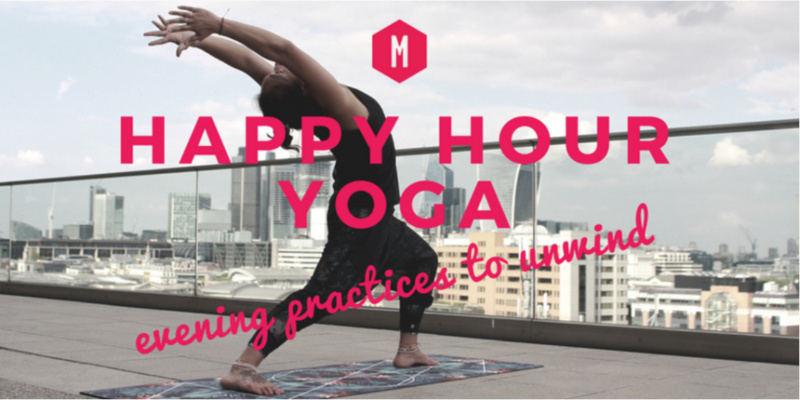 Whether your happy hour involves 25 handstands, or 25 deep breaths in child’s pose. Even adding just 10 minutes between your working day and home life, you’ll be surprised at the surge of energy and life you feel to continue the rest of your evening. That’s why we created our new Happy Hour Course – to help you make the most of that transition from work to home. And September is of course the perfect time to pick up your yoga practice, if it’s dropped off during the summer. Our newest teacher, Adam Hocke, has a wonderful 7-day Begin (Again) Series for you – if you’re new to yoga, or new yet again, and are looking for a beginning to flow series, I’m sure you’ll love this one! Do let us know how you get along in your Happy Hour – I’d love to hear your Happy Hour fixes, anecdotes and antidotes to a busy working day on our Movers Group. And do let me know how your chance to Begin (Again)goes too!